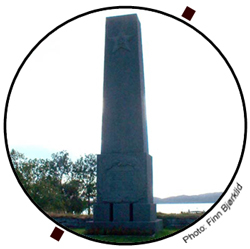 In 1950 a war memorial was blown up to pieces at Bjørnelva, Salten, Norway. Representatives of the authorities explained it this way: It is so unpleasant for tourists to see these Russian war memorials erected everywhere. Operation Asphalt (Operasjon asfalt) in 1951 was an inhuman project of moving all burial sites of Russian prisoners of war (POW) who died during World War II in Norway to a place as far away from the main road as possible. The site is Tjøtta in Helgeland. Some 100.000 Russian POW were sent to Norway during the war. A number of them were sent to Northern Norway. 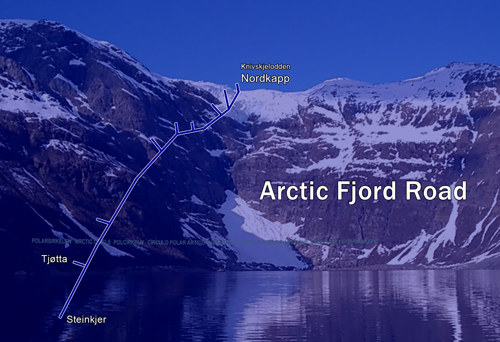 Under cruel circumstances they worked mostly on infrastructure projects such as Riksvei 50 on Saltfjellet. Today this road is E6. The Arctic Circle crosses the E6 on Saltfjellet. The number of Russians who died as POW in Norway is larger than the total number of Norwegian casualties during World War II. It is estimated that 13.700 Russians died. In 2010, only 2.700 had been identified. Work is done by “Painful Heritage” to identify more of the unknown Russian war heroes. The lack of documentation and the use of mass graves make it difficult work. It is sad; the graveyard just northwest of Tjøtta has not been kept up by the authorities, according to its importance. Around 84.000 Russian, Ukrainian, Belarusians and other Soviet nationalities returned to the USSR in the summer of 1945. More than half of these were allowed to return to their homes. The speculations of what happened to the other half have been many. Even executions may have occurred upon arrival in the USSR. In 2015, it is 70 years since World War II ended in Europe. May 8th and 9th have become the days of liberation and victory. The atrocities during the war have been well documented. For many, it has been so painful that it has been difficult to talk about, it has been difficult to hear about it, and impossible to comprehend. On January 27th in 2015, 70 years after the Red Army liberated Auschwitz, survivor Roman Kent spoke of the 11th commandment: “You should never be a bystander”. 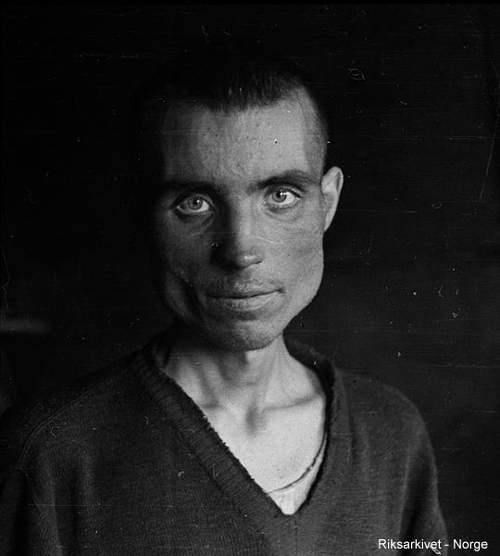 Liberated Soviet POW from Bjørnelva in Saltdal.